Despite his lack of Super Bowls, Dan Marino carved out a clear spot near the top of the all-time quarterback hierarchy. While critics regularly point to this void in his resume, it is tough to question much else based on his impressive career. 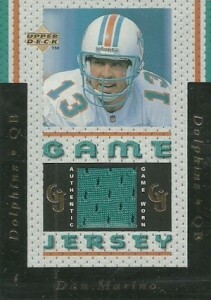 Coming as no surprise, Dan Marino cards remain one of the most popular retired player options in the collecting world. Although his pro career began the day he was selected near the end of the first round of the 1983 NFL Draft, Dan Marino's cardboard career did not begin until 1984. Since then, collectors have been treated to a wide variety of base cards, inserts and hits. Like most players, early cards and certified autographs top the list of the most preferred Dan Marino cards. 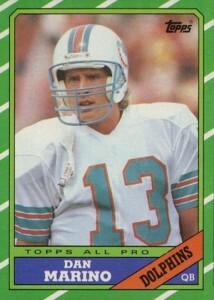 The following guide looks at ten of the top Dan Marino cards available. An effort was made to include a good mix of cards, and collectors of all budgets can likely find a few in their price range. 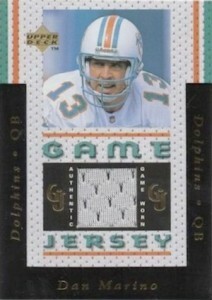 View a complete look at the earliest Dan Marino cards here. The list starts at the very beginning. Fresh off a rookie year Pro Bowl appearance, the 1984 NFL season saw Marino lead the Dolphins to the championship game, where they lost to the 49ers. He would never find himself in another Super Bowl game, but this card still remains a top rookie card and one of the best overall Dan Marino cards. 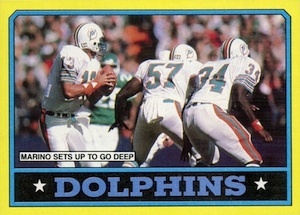 In 1985 Topps, Dan Marino was included in the black-bordered design that has seen a greater appreciation over the years. The horizontal layout, oversized face mask, and cropped image of Marino combine to give him a beefy appearance, more commonly found on a linebacker. 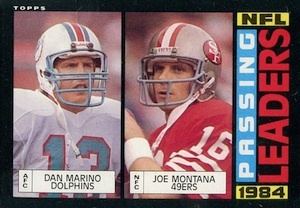 Offering another appealing option, Marino was paired with with Joe Montana on the Passing Leaders subset card (#192) found in the same product. 1984, 1985, and 1986 show that the Topps design was anything but stale during this period of card production. Diagonal green and white make for a distracting card, but that has not deterred collectors. 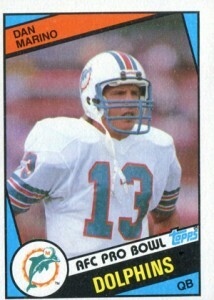 If you prefer a more conventional look, card #44 is a team card, headlined by Marino. Marking a monumental moment for the hobby, 1994 Finest was the first taste of the future for football collectors. Base versions of the Finest Dan Marino card can be found for very cheap, but the Refractor version makes for a more popular card. The higher price tag is easier to justify once you account for the captivating look. 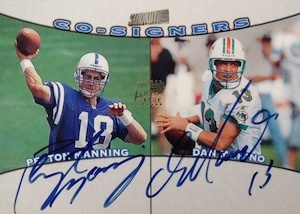 While his first autographed cards were released in 1991, the 1996 SPx Record Breaker Autograph is still among the earliest signed cards for Dan Marino. The base insert was rare in itself, dropping 1:81 packs. The autograph is even more rare at 1:433 packs. With a die-cut design, hologram technology, and an on-card signature, this card has a very distinct look that has aged well. Although hits were still in their infancy, 1996 marked a turning point. Upper Deck Gamer Jerseys brought the first pack-pulled jersey cards to football collectors. 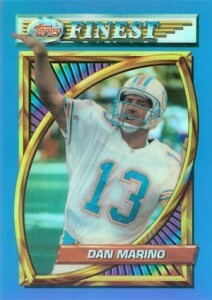 In the case of Dan Marino, there were two different cards. The first featured a small teal jersey piece and the second included a white jersey piece. As an added bonus, the card back specifies the exact date when the jersey was worn in action. Autographics built their name in basketball, but the same look was applied to the football set as well. 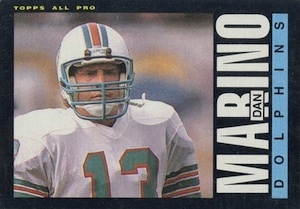 In addition to the on-card base autograph card, Marino has a Century Marks parallel, hand-numbered to 100. With two HOF quarterbacks on one card, this is an impressive sight. But when you consider that Peyton Manning was in his rookie year, the cards take on added significance. Topps struck gold with this pairing, but Marino also shares a card with Ryan Leaf and Kordell Stewart in the same set. In 1997, Upper Deck produced one of the most celebrated football products with 1997 Upper Deck Legends. The only real downside was the lack of current stars. Upper Deck attempted to rectify that with small updates in 2008 and 2009 Ultimate Collection. Marino was part of the second update in 2009, shown below on the right, and then Upper Deck gave the entire line a refresh in 2011 Upper Deck College Legends. Despite losing the NFL license, the college-themed cards evoke the same feel as the originals. Upper Deck eventually disclosed basic print runs for the autographs, and Marino was part of the rarest grouping (Group A - 1:1,087 packs). As a top all-time player in the most revered position, Dan Marino autographs will continue to be included in new products as long as he is willing to sign. Five Star is one of the most premium products available and the Signatures Patch Card from 2012 offers an on-card autograph, patch piece and limited print run.